This light painting shot was taken with a 30-second exposure, a tripod, and a remote shutter release. Let me illustrate with an example. Earlier in the week, I was called into the back room since two large mourning doves had just alighted on the porch balcony and were acting affectionate. I grabbed my camera en route, pulled off the lens cap, and turned it on. As soon as I walked in, I zoomed in the lens, composed the image, and clicked the shutter. (Insert long click sound here.) It was only after taking the shot that I realized that the camera was still set on manual with a 30-second shutter. After an agonizing thirty seconds spent waiting for the shot to finish, I quickly adjusting the settings and tried again … just as both doves got spooked a flew off. I was left with nothing but this overexposed memento of their visit. This picture was supposed to be of mourning doves but was taken with a 30-second exposure on a bright day. 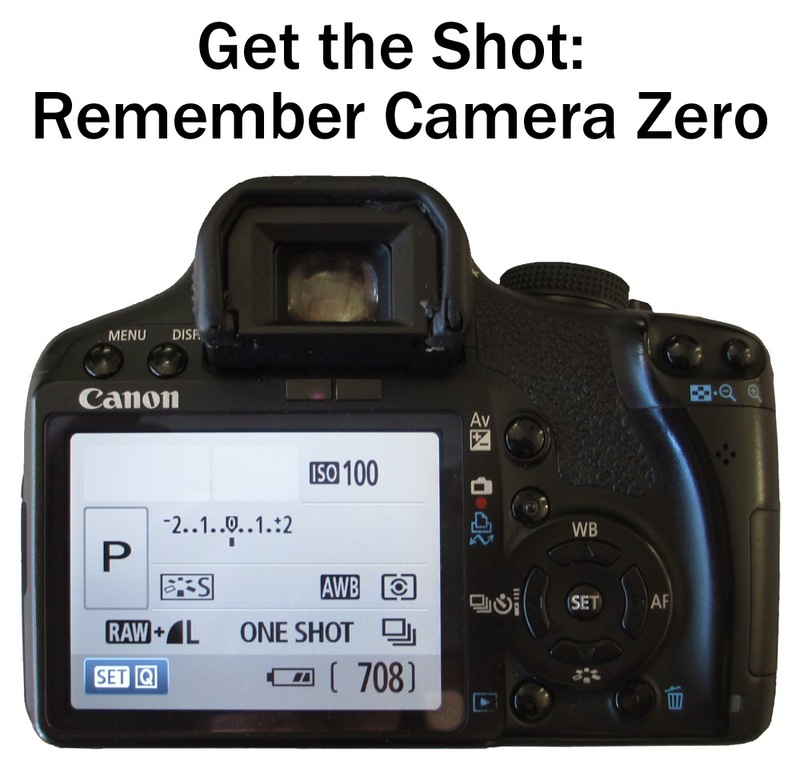 That kind of missed opportunity happens to everyone, but you can prevent it by remembering to return to “camera zero” each time you finish shooting. “____ zero” has become a catchy way of talking about getting an accomplishment back to the beginning, whether that be “inbox zero” (no new mail) or “dirty-dishes zero” (a time of celebration in our household). So, camera zero is the selected settings that you expect your camera to have each time you turn it on to start shooting. Mode: My default shooting mode is ‘P’ for Program. In program mode, the camera chooses the aperture and shutter speed, but you set the ISO value. I keep my ISO at 100 (the native speed for my DSLR). P is a great choice for your camera zero setting, because it gives the camera the option to choose both the aperture and the shutter for the given situation. Quality: I shoot RAW+L which creates a RAW file plus a high quality jpeg. This gives me the flexibility of using the jpeg with the critical data and flexibility provided by the RAW file. Unless memory and file size are a huge issue, you should always be shooting at the largest quality jpeg (without compression) that you can. Whether you shoot RAW or not is up to you. AF Mode: The majority of the time I shoot in “one shot,” rather than AI Focus or AI Servo, which means that I need to set the focus of the shot every time. Drive Mode: Continuous. Although I do not often use the burst function to take multiple pictures at a time (possible in continuous but not in single), I find it is a useful feature to have. This is most often the setting that I forget to come back to if I have been using the 10-sec or 2-sec timer options. Metering Mode: Evaluative, though I occasionally use spot metering for shooting birds. White Balance: Auto. Shooting in RAW gives me the flexibility to adjust the white balance in post-processing and prevents me from over-thinking this setting. Some landscape shooters swear by shooting always in ‘cloudy’ to get the warmer sun feeling, but I think auto is a much safer and more consistent choice. Exposure Compensation: Zero. My most common mistake here is forgetting to take it off a bracketed setting (shooting three different exposures) and restore it to the one-shot zero setting. Knowing is half the battle when it comes to camera zero. The other half of the battle is taking those precious seconds when you’ve finished shooting to do a quick run through of your settings and return them to camera zero. Get in the habit of looking back over your display and at your lens each time you turn the camera off. That way, the next time a split-second opportunity presents itself, you’ll be ready!